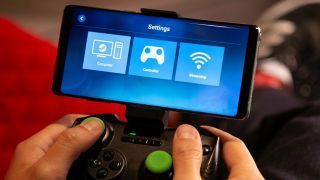 After its announcement for iOS and Android earlier this month and a successful Android beta, Valve’s Steam Link app will not be launching on iOS. Apple had originally approved the app for launch on the official Apple App store on May 7. However, the Steam Database Twitter account has posted that Apple revoked its approval of the app on May 10, just one day after Valve released the news. Steam Database released a statement which says that Apple cited “business conflicts with app guidelines that had allegedly not been realized by the original review team” as the reason for its decision. The statement goes on to say that Valve did appeal to Apple, “explaining the Steam Link app simply functions as a LAN-based remote desktop similar to numerous desktop applications already available on the App Store.” This appeal was, however, rejected and the Steam Link app remains blocked from releasing on the App Store. At the moment, it’s not clear what Apple’s “business conflicts” are, though we have contacted Apple for comment and will update this piece if and when we hear back. It seems, then, that the free app designed to allow Steam users to access their game library on mobile will not be available to iOS users any time soon. Android users can, however, download the Beta version of Steam Link from the Google Play Store right now.